Hello Nosh Show Listeners! Episode 86 is now live! Yup, #86, that's not a typo. Don't forget that the Nosh Show is moving to a weekly format so I'll be posting my episodes here, but if you need more food podcast fix, keep an eye on thenoshshow.com for a weekly update. We have a bit of fun teasing Marvo about the expansion, but then it was time to get down to business. So I had a bit too much followup, including this Domino's salad which I hadn't actually eaten before the show. I did eat it the next day and it tastes like a prepackaged salad. It's not bad, but it's as simple as can be. It's more lettuce than anything and it just doesn't have that pop of a salad that's been made in the last few minutes. It's fine if you are in a pinch but don't expect miracles here. I also tried the new Cinnamon Donut Chips Ahoy. Like the salad, they're not bad, but nothing I've rushed to finish, let alone buy again. Have you noticed how the original flavored chips ahoy thins are far outselling the cinnamon ones? Yeah, that's going to happen here too. They do have a donut finish to them, but overall they are just meh to me. Junk Food Guy enjoyed them more than I did. 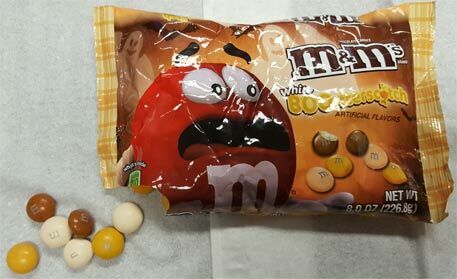 Lastly, I threw out some thoughts on white boo-tterscotch M&M's. I talk in a circle a bit, but the main point is that I can see people enjoying these, I just don't love them. I do love butterscotch in general, but this very much reminds me of so many sea salt caramel ice creams I've had, and if you read this blog, you know those ice creams get my respect but not necessarily my undivided attention. I just had a bit of trouble clicking in to the texture/flavor combo here. The day after the show, I wound up mixing these with some pretzels and I enjoyed them more that way. It's not that they are bad, it's just that I need some kind of X factor to go with them. I hope that makes sense. Alright, have a good short week everyone! HA, apparently I missed (or ignored) those! it's even more "interesting" when you consider how they are working towards a softer, friendlier image, you don't really expect them to tease people like that right now. 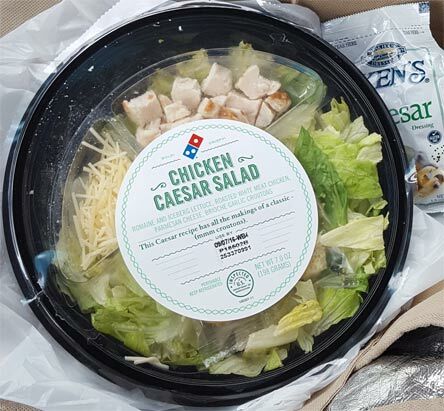 Let's take bets on how long Domino's salads last!